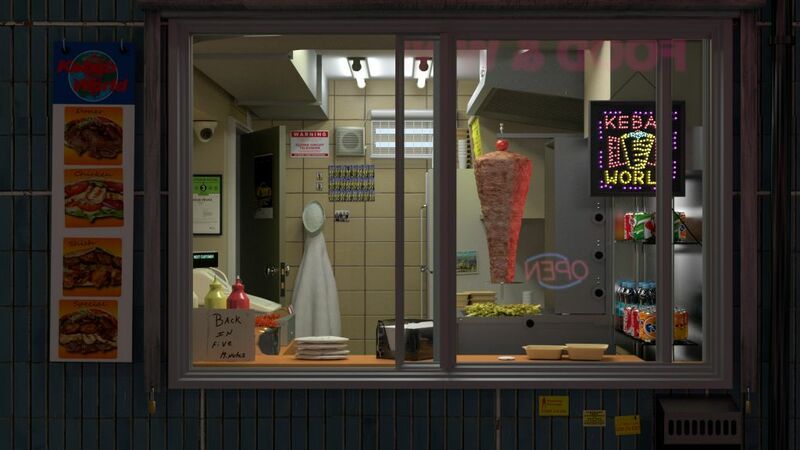 A simulation of late-night London reflected in the window of an East-end kebab shop. An exercise in minimal animation. David Theobald is a video artist born in Worthing in 1965. Although originally trained as a chemical engineer, he pursued a career in finance for fifteen years, living both in New York and London. Twelve years ago he decided to change profession and dedicate himself to becoming a full-time artist obtaining an MFA from Goldsmiths in 2008. Most recently, his main works have been digital animations structured as conventional films or as continuous loops with no discernible beginning or end. Recent exhibitions include the solo show 'PC World' at Motorcade/Flashparade, Bristol, the 2013 Creekside Open, '971 Horses and 4 Zebras' with a screening at the Tate Modern, 'Deepest Sympathy' at Ikon, Birmingham, and Animate Project's' 'Digitalis'. David was winner of the 2009 Creekside Open, selected by Mark Wallinger, the Open West 2011 and the Motorcade/FlashParade National 2012. David is a visiting lecturer at Wimbledon College of Art, part of University of the Arts.